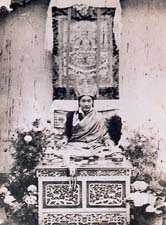 Dudjom Rinpoche studied with the most outstanding lamas of his time, beginning his studies with Khenpo Aten in Pemakod. He studied many texts and commentaries, such as the Dom Sum (Three Precepts), Chod Juk, etc. It was said by Lama Konrab that at the age of five, he started discovering Ter. When he was eight years old, he began to study Santideva's "Bodhicaryavatara" with his teacher Urygen Chogyur Gyatso, a personal disciple of the great Patrul Rinpoche (A.D.1808-1887). He studied for sixteen years with Za-Pokhung Tulku Gyurme Ngedon Wangpo and had great realizations on the teachings of Dzogpachenpo. From Jamyang Khyentse Chokyi Lodro, he received the tantric teachings (Gyud, Lung, and Men-Ngag) of the "Sangwa Nyingthig". He further received Dzogchen teachings from Jedrung Thinley Jampai Jungne (Dudjom Namkhai Dorje) of Riwoche. In his teens, Dudjom Rinpoche attended the great monastic universities of Central Tibet, such as Mindroling, Dorje Drak and Tarje Tingpoling, as well as those of East Tibet, like Kathok and Dzogchen. It was to Mindroling that he returned to perfect his understanding of the Nyingma tradition. Thus from the Mindroling Vajracarya, Dorzim Namdrol Gyatso, he learned the rituals, mandalas, songs, dance and music of Terdak Lingpa, along with many other teachings. There were many other great teachers from whom Rinpoche had received all the teachings of the Nyingma School. From Togden Tenpa, he received both the wang and lung of the "Dzogchen Nyingthig Yabshi", which was the lineage of the great Khenpo Nyoshul Lungtok Tenpai Nyima. From Jedrung Rinpoche of Riwoche, he received the "Kangyur" lung, "Dam Ngag Dzod", the seventeen "Sangchen Ngepai" tantras, "Nyingthig Yabshi", and so on, as well as all the teachings of Dzogpachenpo. He received them completely and was considered his teacher's heart son. From Tulku Kunzang Thekchog Tenpai Gyaltsan, he also received many deep and important teachings. From Ngagtsun Gendun Gyatso, Rinpoche received all the teachings of Pema Lingpa, the "Dzod Dun" (the Seven Treasures of Longchenpa, 1308-1363), among many others. Furthermore, from the great Khenpo Jamde, Pande Odzer (disciple of Mipham Rinpoche, 1848 - 1912), Rinpoche received the "Nyingma Kama", "Kagyed" empowerments, Sangye Lingpa's "Lama Gongdu" and "Sangwa Nyingpo" according to the Zur tradition; as well as the cycle of the "Osel Sangwa Nyingthig". He also received many tantra commentaries like the great commentaries of Mipham himself, the "Nyingthig Yabshi", and so on. Rinpoche considered Khenpo Jamde as his second kindest Lama and took many vows of Pratimoksha, of Bodhisattva, and of Vajrayana from him. He also received teachings from the great beings who were disciples of the great Khenpo Nyoshul Lungtok Tenpai Nyima: Khenpo Ngawang Palzang, Chadral Sangye Dorje, Lama Urgyen Rigdzin, Kathok Chagtsa Tulku, Pulung Sangye Tulku, and Gyurme Phendei Ozer, among others. He received teachings from them and he also gave teachings to them.